If you’re looking to work with finished woodwork if you’re going to use plenty of bits, you might want to look for a regular drill. However, if you’re working with big and long fasteners and you want to drive them, you’ll need something that’s powerful and solid. Impact drivers fit this category as they don’t twist or seize when faced with resistive torque. In this list, we’ll provide you with the best impact drivers you can find on the market. Although the Dewalt DCF885C1 has a compact design, it delivers so much power. This compact design enables it to fit into tight spaces and makes it easy to handle. Its lightweight at just 2.8 pounds contributes greatly to its ease of maneuvering, too. The Dewalt DCF885C1 features a battery that conserves both power and battery lifetime. Once the battery is fully charged, the battery charger will stop the charging process so it extends the battery’s longevity. Moreover, the hex driver system on the Dewalt DCF885C1 comes packed with versatility. Using that system, you can fit any fastener for long screws and bolts. Furthermore, the Dewalt DCF885C1 comes with 3 LED lights that work on improving the visibility which gives you a clearer vision no matter the circumstances. 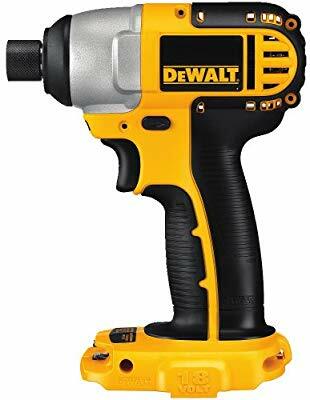 The Dewalt DCF885C1 delivers up to 1,400 pounds of torque thanks to its hammer-like motion and the strong spring that’s placed inside the driver to deliver powerful shots to long screws. Although the Dewalt DCF885C1 is quite powerful, it’s not the best for heavy duty jobs. Maybe if you replace the 1.5 AH battery with a bigger one such as a 3 Ah battery. But otherwise, don’t count on it. Finally, the Dewalt DCF885C1 comes with a 3-year warranty on the driver and all their power tools. All you need to do is register the unit online and you’re good to go. The Dewalt DCF885C1 is a great choice for a driver if you’re a homeowner who’s planning to use it around your house. 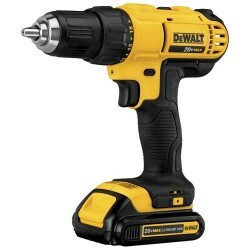 Household repairsrepairs don’t require over-the-top output and power, and the Dewalt DCF885C1 is suitable for that. For bigger projects, you might want to get a bigger and more powerful battery as the 1.5 ah one might not do the trick. But if you’re planning on using your driver for extreme projects, you should skip this one. The Milwaukee 2753-20 M18 is pretty compact at 5.25 inches in length and 2.1 pounds in weight. Its compactness and light weight mean you can fit it in tighter spaces and hold it at tougher angles. The Milwaukee 2753-20 M18 feels comfortable in your hands thanks to the improved ergonomics. 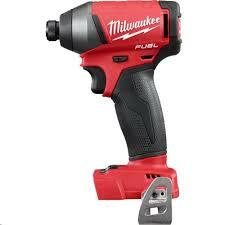 The Milwaukee 2753-20 M18 comes with a brushless power state motor that gives you the best efficiency. It’s capable of delivering up to 1,800 inch-pounds of torque to facilitate the toughest job. It’s also provided with a 4-mode drive control where each mode delivers a certain output speed and power so you can work with more precision and according to your needs. The first mode goes from 0 to 850 rotations per minute, the second reaches up to 2,100 RPM, and the third reached up to 3000 RPM. The fourth mode is the unique feature about the Milwaukee 2753-20 M18 as it’s basically a combination of the 3 previous modes but with automatic adjustments. The “self-tapping screw mode” is activated in three stages. The first one is a controlled start that reaches 3,000 RPM to reduce walking. Then, it jumps to the fast driving stage as it spins on 3,000 RPM to pierce through the material quickly. Finally, it slows down to a controlled finish at 750 RPM to reduce the possibility of any breaking and stripping. With the Milwaukee 2753-20 M18, you’ll need to perform regular maintenance work like cleaning the contacts on the battery pack and removing dust from the vents. Depending on the frequency with which you use it, you might need to send it to a service facility for cleaning and lubrication. You can use a 1.5 mAh battery or a 5 mAh one according to your needs and the intensity of your work. The Milwaukee 2753-20 M18 is the best impact drill in its class. If you’re working with a lot of screws –especially long or large ones, the Milwaukee 2753-20 M18 is going to serve you well. 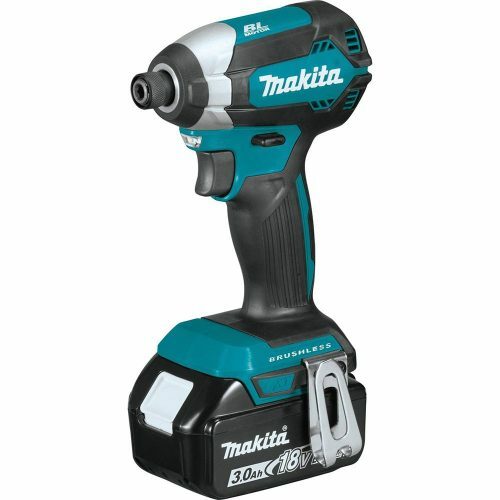 At that price point, you can’t get yourself a more durable and powerful drill. When it comes to combining durability with performance, the Dewalt DC825B does a great job that’s quite hard to beat. The Dewalt DC825B is capable of delivering up to 1,330 inch-pounds of torque at speeds of 2,400 and 2,700 rotations per minute. This should make heavier-duty tasks such as driving fasteners into wood, metal, or concrete a bit easier. Moreover, you have plenty of control with the variable speed trigger. It allows you to increase the speed, number of impacts, and torque by increasing the pressure on the trigger. 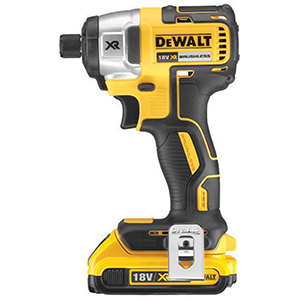 The Dewalt DC825B is also quite compact, lightweight at 4.6 pounds, and lets you change accessories easily and quickly. The body itself has an anti-slip ergonomic grip while the motor is frameless with replaceable brushes. The gear case being made of magnesium and the transmission being all metal makes the Dewalt DC825B quite durable. The only drawback to the Dewalt DC825B is the fact that its charger and battery are sold separately and cost quite a lot. Nonetheless, they come with a 3-year limited warranty like the tool itself. You also get a one-year free service contract and 90-day money back guarantee. So even though you’re paying a lot in the beginning, it’s the best impact driver you can get for the money. The batteries and charger have to be bought separately and aren’t that cheap. The Dewalt DC825B is the perfect choice for tackling a variety of heavy applications and is a great bang for your buck in the long run. Whether you’re driving or removing fasteners in metal or concrete or even drilling into wood or metal, it’s going to fit your needs. If you’re looking for versatility and solid performance, the Makita XDT131 is the impact driver for you. Its design is ergonomic and compact at 5 inches long and 3.3 pounds (with the battery included) for reduced hand fatigue. The rubberized soft grip also contributes to the comfortable feel of the Makita XDT131. The Makita XDT131’s BL brushless motor gives it around 50% longer run time, enhanced power and speed, as well as extended longevity. Its maximum torque is 1,500 inch-pound and its speed reaches 400 and 600 RPM. The kit comes with an 18V LXT 3.0 mAh battery included. This battery reaches its full capacity after only 30 minutes of charging. This reduces downtime and maximizes your productivity. It also includes a bit holder and a bit set that consists of 50 pieces. Moreover, the Makita XDT131 can be used for a wide variety of tasks including driving, fastening deck screws, TEK screws and cabinet screws. You can also use it to tighten down lag bolts and much more. Furthermore, the convenient ¼-inch hex chuck enables you to perform quick bit changes while the dual LED lights illuminate your work area for better visibility. Finally, the all-aluminum gear housing provides the tool with better durability, especially on job sites. If you’re an electrician, plumber, mechanic, woodworker, a pro contractor, or even a homeowner that wants to fix up some things in the household, the Makita XDT131 will prove itself as the best impact screwdriver you can get. The Ryobi One+ P236 is a great budget buy. Even though it’s relatively affordable, it still offers a lot of great features and will impress you with its performance. 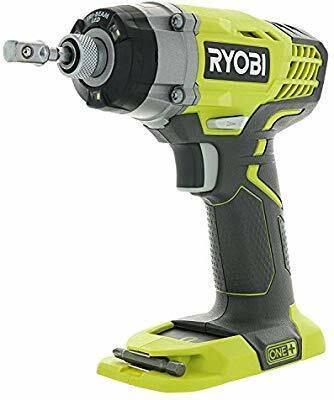 The grip of the Ryobi One+ P236 has a rubberized notched overmold that enables you to hold it securely for increased accuracy. No matter the unsteadiness of the circumstances or the difficulty of the angle. Since it only weighs around 2.5 pounds (without the battery), it should be easy enough to maneuver and handle. A great thing about the Ryobi One+ P236 is that it’s compatible with both lithium-ion and NiCad batteries. With a 4 mAh battery, you can use it for quite a long time. When it comes to power, the Ryobi One+ P236 can reach a speed up to 3,200 RPM and a torque of 1,600 inch-pounds. This is more than enough for most of your household jobs. Moreover, the LED Tri-beam lighting illuminates the workplace and helps you see better in all circumstances. The magnetic try is a clever addition as it allows you to keep bits and fasteners on the unit instead of occupying your hand with them. Finally, the Ryobi One+ P236 comes with a 1-year warranty on the driver. The Ryobi One+ P236 is a great driver with solid battery life. If you’re on a budget or if you’re going to use your driver for simple DIY jobs at home, then it’s the ideal choice for you. It could get a little heavier with the battery attached, but by all means, it has some higher-end features like the magnetic tray and LED tri-beam lights. The Black+Decker BDCI20C is a high-performance driver that comes at a very affordable price. It runs on the included Lithium-ion battery that’s included in the kit when you purchase it. It only weighs 3.5 pounds and its dimensions are 7.9 x 3 x 9 inches. It’s generally compact and easy to handle. The Black+Decker BDCI20C comes with a ¼-inch Hex Chuck. This allows you to remove or insert the hex bit quickly to save your effort and time during the job. 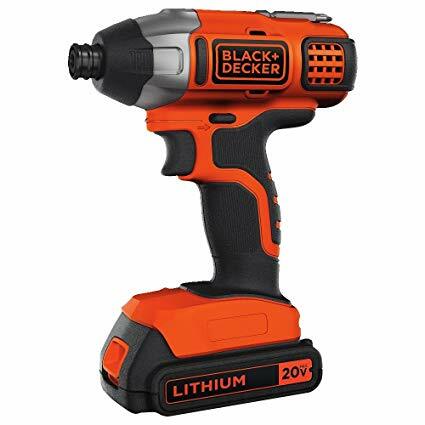 Moreover, the Black+Decker BDCI20C delivers a torque up to 1,375 inch-pounds to give you all the power you need to finish tough projects with ease. Its speed reaches an impressive 3,000 rotations per minute. The battery of the Black+Decker BDCI20C doesn’t take long to charge but it’s still not the quickest on the market. There are no problems with the operation of the Black+Decker BDCI20C but its build quality may make it prone to wearing out in a shorter period of time than other rivals. Finally, it comes with a 2-year limited manufacturer’s warranty. This means that if anything should go wrong with the components, Black+Decker will replace it for you. The Black+Decker impact driver is light, easy to use, and makes any job or project around the house a lot easier. It’s especially great if you’re driving wood screws. But it works for everything else as long as you’re using the right bit for the screw. The Dewalt DCK240C2 is one of the best products made by Dewalt. Its compact and solid design qualify it to withstand the toughest jobs. Both components of the Dewalt DCK240C2 include a motor, so it can drill 117 foot-pounds without any loading. You get two transmission speeds to fit your needs. The first one reaches 450 RPM and the second reaches 1,500. You can switch between the powers with the 16 clutch setting options around the neck. The non-slip and thing hand grip makes it easy and comfortable to carry with one hand. There’s also a belt hook on either side of the handle that you can use to stabilize your grip. The Dewalt DCK240C2 comes with two 1.3 Ah lithium-ion batteries. They combine between being strong, lightweight, and easy to move around. To fully charge the battery, however, you’ll need to wait a whole hour. Generally, this isn’t a long time, but it falls short of other rivals’ charge time. In total, the Dewalt DCK240C2 combo weighs 9 pounds. The Dewalt DCF885 impact driver weighs 2.8 pounds while the Dewalt DCD771 drill weighs 3.6 pounds. Finally, you get a 3-year limited warranty on the product, a 1-year free service contract, and a 90-day money back guarantee. The cool thing about the Dewalt DCK240C2 is that it comes with both an impact driver and a cordless driver. Once you get this kit, you’ll basically need nothing more for any projects in the future. It’s an investment that’s definitely worth the money. The Black+Decker 20V weighs even less than 5 pounds. It’s very user-friendly. Being small and light greatly reduces your hand fatigue while the soft grip handle makes it easy to use and comfortable to hold. The kit comes with six brad point drill bits, ten 1-inch screw driving bits, nine 2-inch screw driving bits, four nut drivers, and a magnetic bit tip holder. With all these bits available, any DIY project at home will be a breeze. The Black+Decker 20V is capable of producing 300 inch-pounds of torque and can reach a speed of up to 750 RPM. The 24-position clutch gives you complete control to prevent the screws from sinking too deep, stripping out the head, or even breaking the shaft. If you’re looking to drive drywall screws you should use the low clutch setting while if you’re going to drive larger screws or into harder surfaces, you should go for the high clutch setting. Furthermore, the 3/8-inch chuck enables you to quickly and easily change bits. The fact that the Black+Decker 20V is wireless makes it convenient as it’s portable, easy to maneuver and store. 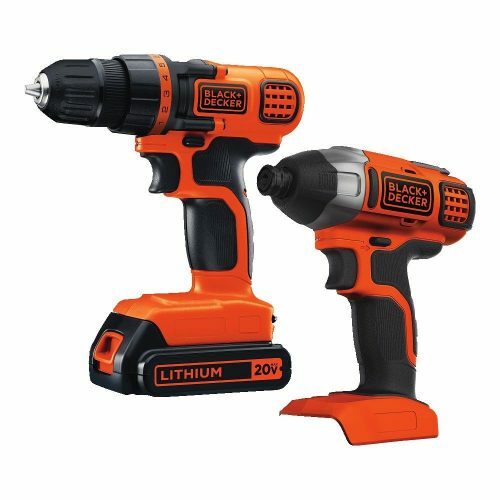 If you’re looking for a drill that suits your regular day-to-day use, the Black+Decker 20V MAX Drill/Driver Impact Combo Kit will be absolutely satisfactory for you. It’s really lightweight, easy to use, durable, and efficient. The Porter-Cable PCCK640LB is a fully integrated tool with a high torque motor. Its lithium-ion batteries deliver a lot of power that provide you with long run time. It’s quite lightweight at only 3.2 pounds. Combine this with its ergonomic design and you’ll get a driver that’s very easy to handle and use with only one hand. Moreover, its cold-forged internal block and no-slip grip reduce hand fatigue after extended periods of work. Furthermore, the bumpers on either side of the tool work on minimizing the wear and tear on the outside of the driver which extends its durability. The easy-load ¼-inch hex quick-change chuck allows you to switch bits easily while the LED work lights illuminate your work area for better vision. 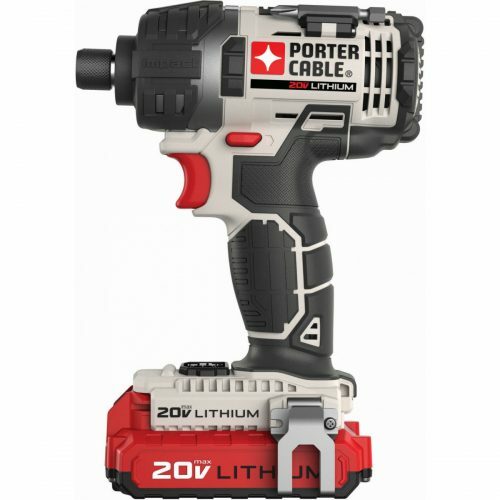 The Porter-CablePorter-Cable PCCK640LB comes with a high-torque motor that delivers up to 1,495 inch-pounds of torque. This is quite impressive for such a compact size. In addition, the Porter-Cable PCCK640LB has a high-performance transmission that maximizes the efficiency and speed of your driving. The Porter-Cable PCCK640LB is an overall good investment. It’s a high-quality and performance driven-tool that’s surely going to make any DIY job you do easier. 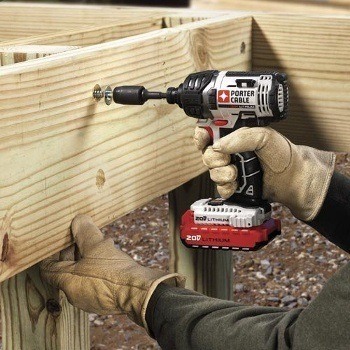 Which Is The Best Overall Impact Driver Drill for You? Depending on the job at hand, you should choose the specifications of your driver. The Milwaukee M18 is a pretty great choice overall. It does a great job and comes with a 5-year warranty. The Dewalt DCK240C2 would be a good choice for someone who’s looking to combine the quality of performance and the affordability of price. If you’re looking for a cheaper choice, you could go for the Dewalt DCF885C1. Although it’s a bit bigger and heavier. On the other hand, if you’re looking for the best budget buy, you should opt for either the Ryobi One+ P236 or the Black+Decker BDCI20C.